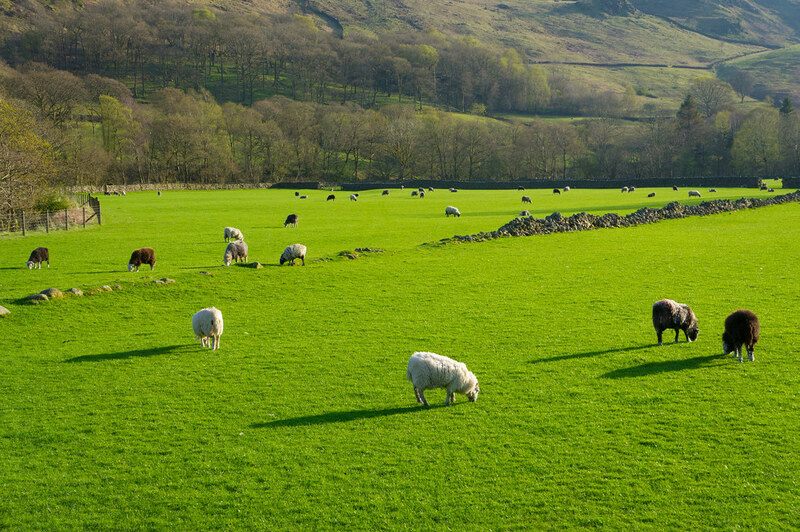 The Lake District is one of England’s most scenic National Parks, with steep hills, lush green valleys, glittering lakes and inviting Pubs. 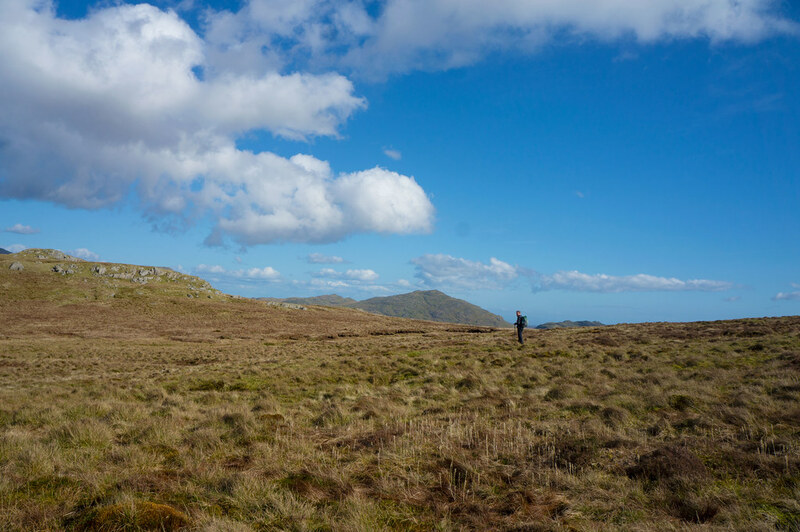 I traversed this beautiful area from Ravenglass to Windermere in a 125 km route and hiked up some of the most well-known mountains and camped at some beautiful sites. It’s funny to think that on the birthday of the website I started my Lake District hike. 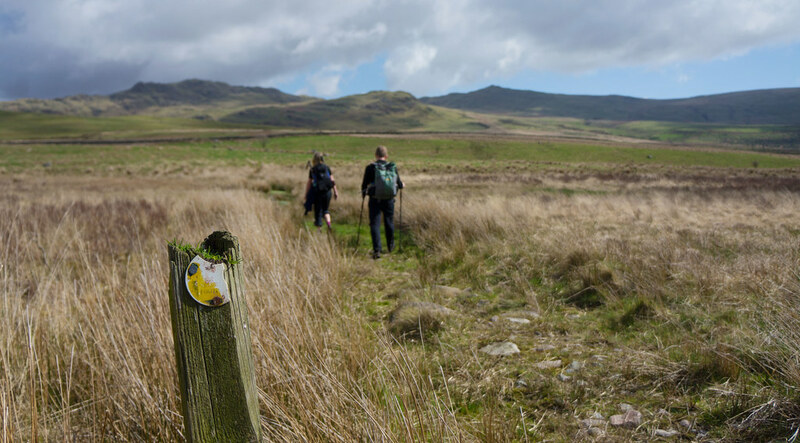 Funny, as English blogs were one of the inspirations to start this site, and on it’s fifth birthday I was setting off to backpack in one of the most popular National Parks in the UK. 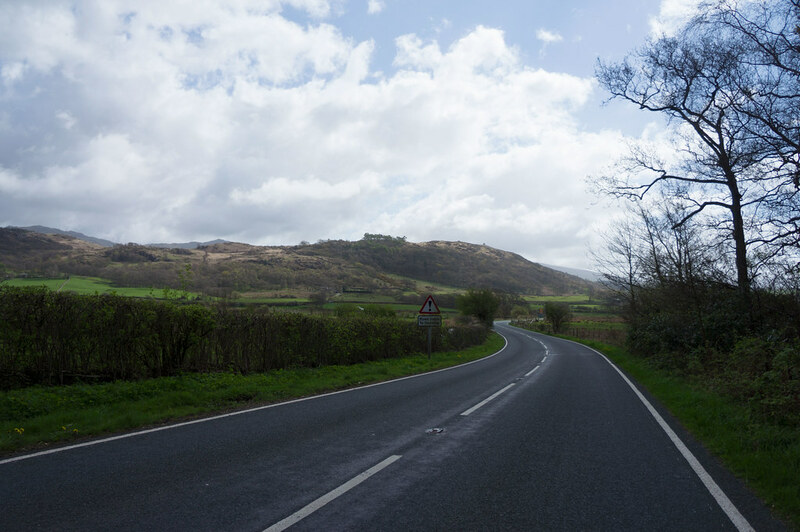 The Lake District has long appealed to me, and with the help of Visit England I was able to realize this trip. 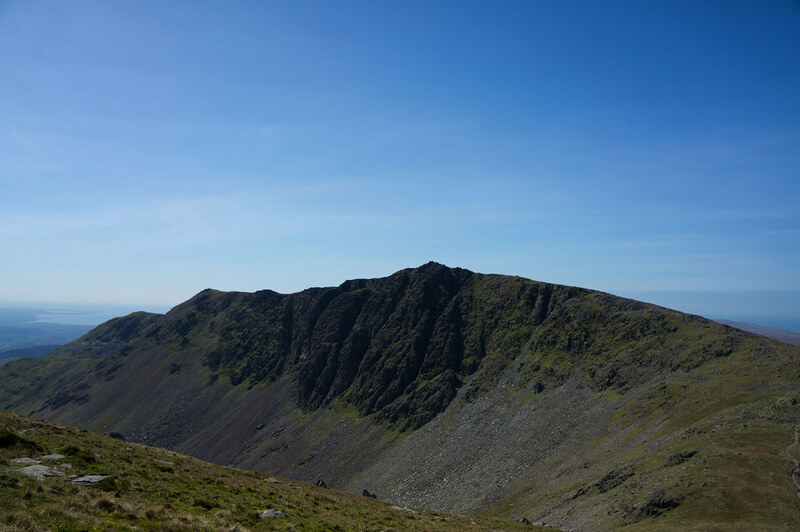 As I had six days for backpacking I early on decided that a traverse would be best to see as much as possible, and my list of things I’d like to see was long, as I explained in my “Planning a Trip in the Lake District” article. So on Monday morning I left Manchester by train and arrived punctual at 10:55 o’clock in Ravenglass, where I meet Steven and Traci who would join me for the first day. We had a quick lunch at the Café in the Railway Station and then set off towards the hills. Steven explained to me the system of paths in the UK - I still am baffled by it! 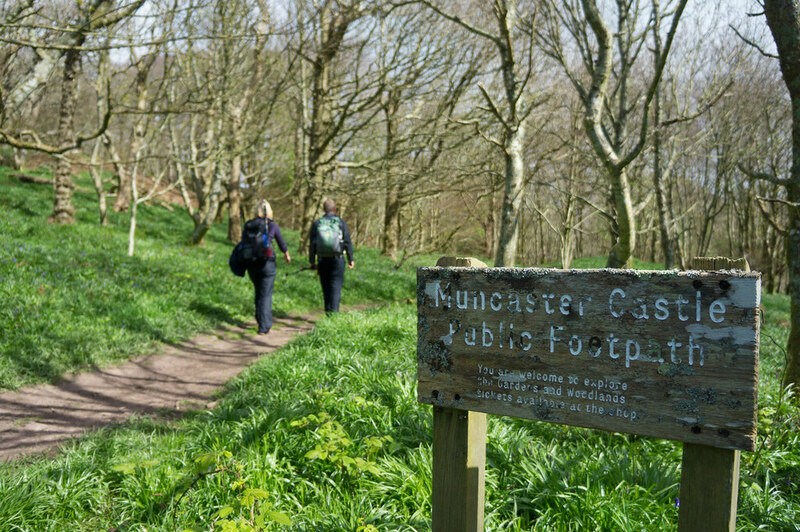 - and soon we were hiking past cows to the Muncaster Castle. We passed it, eager to get to the hills, but before that a short stroll on the street was necessary. As someone from the continent the left side traffic was something to be well aware of, as you do everything just the other way around as you’d at home. The walk on the street was quickly done, and then it was off into the wild - or the swamp. 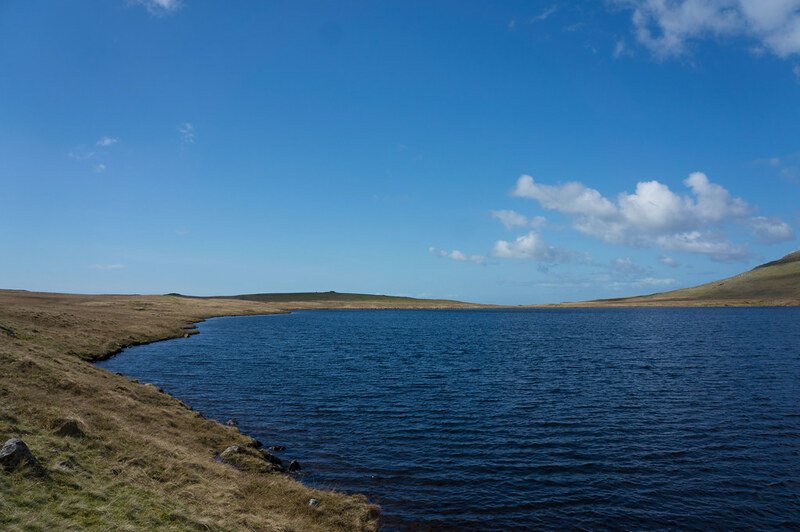 For quite a bit we were searching for the path, which was marked on our maps, to Devoke Water, but in the end we just gave up, took an aim and just kept on walking. Surely enough, close to the lake we then happened upon a trail which we followed for a bit before a short break. I refilled my water bottles and we enjoyed the fine views over the lake. As we had still some bit to go we continued, following the path to Woodend and then up to Great Worm Crag. The mandatory first summit photo was taken, I made a few quick bolder moves and onwards to White How and Green Crag we continued. While there was a path marked down on my map, the reality looked different. Through a swamp, which has claimed the life of a sheep or two, we made it with even wetter feet to the foot of Harter Fell. 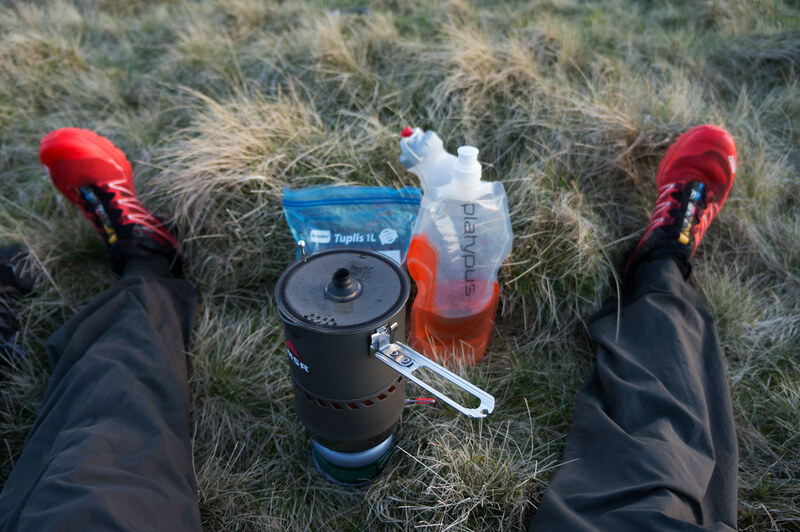 The sun was shining, the full water bottles added a couple of kilograms of weight and so we started our ascent. Grazing sheep were gazing as we passed them by in what must have seemed like snail speed to them, but then, finally, we made it to a large “plateau” which lays a dozen of meters under the summit. 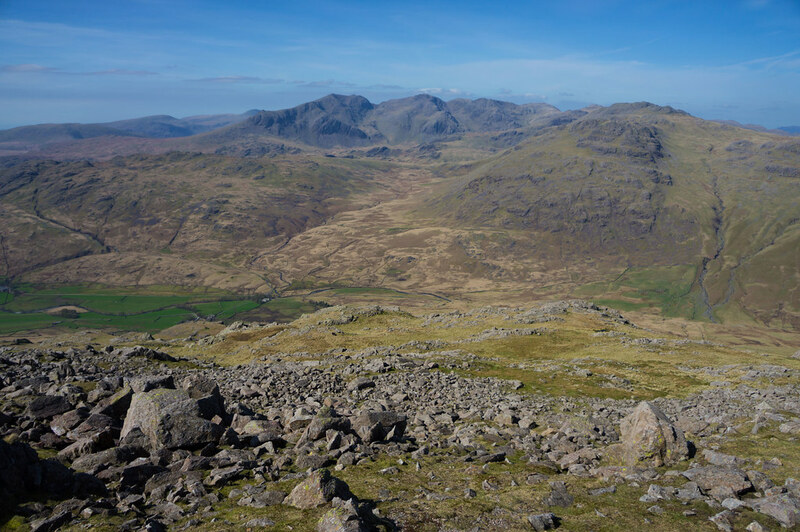 We walked the last bit up to the Summit Marker and enjoyed the wide views: To the West lay the sea and the Isle of Man, a bit further to the north the southern tip of Scotland came into view, and to the north Sca Fell and Scafell Pike dominated the view and demanded attention. 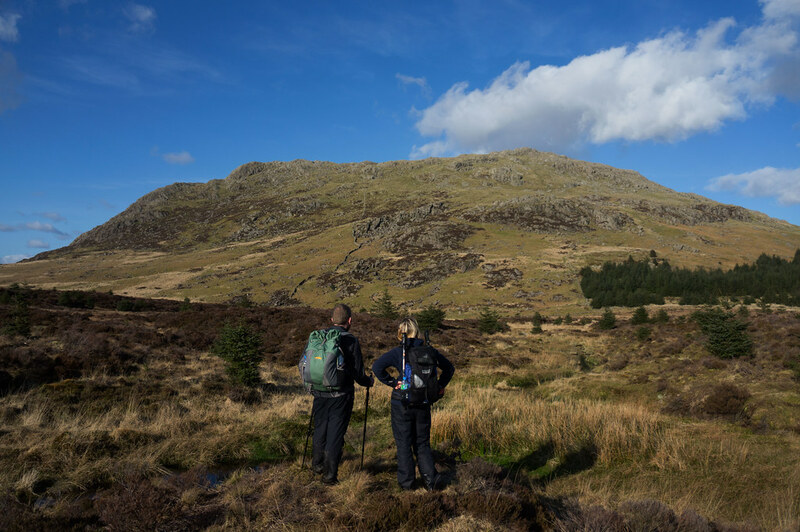 Further to the east Brown Pike, Dow Crag and the Old Man of Coniston could be seen. It was a magnificent place to be. With plenty of space to pitch the TrailStars Traci and Steven pitched theirs on the plateau, while I went a bit further up between two large boulders. As the wind picked up we ate dinner together, enjoyed the sunset and rising moon, and had a Finnish dessert before hitting the hay. 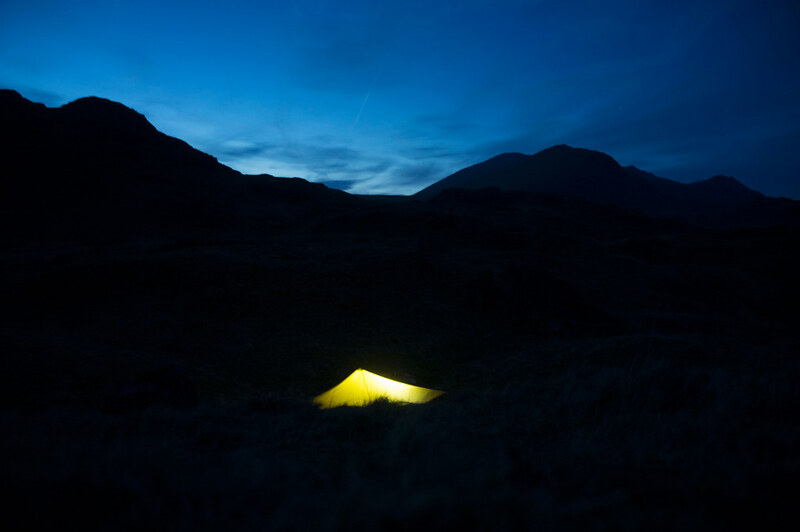 During the night the wind turned and was blowing well into my shelter. Not being amused I just took out a peg which practically closed the TrailStar, and a more calm nicht could be enjoyed. I was up with the sunrise (the sun still rising “late” back then) though the high wind demanded that I wear all my layers. We packed up and said our good byes, Steven & Traci heading back to Eskdale while I set off to the west. Through the re-forested Hardknott Forest I made my way down as the sun was rising and promised a fine day. Down at the river I happened upon a Parking place with benches, which made for the perfect breakfast spot. I enjoyed the bird song and purl of the river, only once or twice interrupted by a passing car. Refilled with water I walked down the street, passing by the gorgeous houses in the valley. A mother who was carrying her daughter walked a horse to the meadow and greeted me with a smile, and it is easy to imagine how good life must be far off the beaten track between the hills. I hiked on, finding the sign and path which brought me on line with my first summit of the day. After some backtracking and climbing fences I made it on the road to Walna Scar Road. This path is so wide that you three to four people could hike next to each other - but right now I was alone, just far off in the distance I could make out a few couples slowly making their way to the top. Along the Long House Gill stream the path climbed continuously up, and at the crossroad I sat down to have a zip of water and some nuts. A father and son couple was now following behind me. I packed up and continued, the summit of Brown Pike getting closer and closer. As I reached the crossroad underneath the summit, the wind welcomed me. 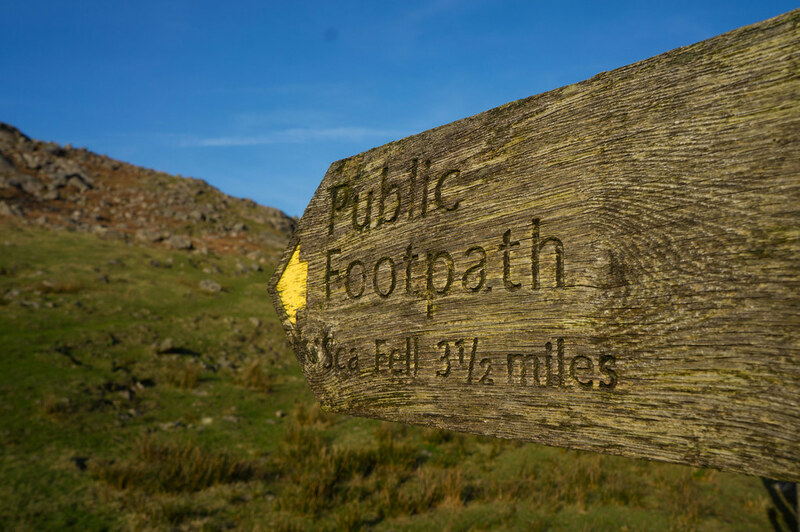 I said a “Hiya” greeting to the couple who arrived with me at the crossroad from the other side, and while the husband was looking into his Wainwright the wife set off towards Brown Pike. I had a quick look across the valley and could see dozens of people on the Old Man and this side, so I continued. As I hiked from Buck Pike to Dow Crag two dayhikers and their dog emerged from the south rake, a scramble I had intended to do but as it would have meant walking down and then scrambling up again, I decided to leave it for the time being. However, seeing those two emerge, elated, I was a bit disappointed that I did not have the time to do this fine scramble. Dow Crag was busy with families eating a summit lunch (in T-shirts and shorts in the blazing wind, nonetheless), and so I continued. The Old Man of Consiton was still so busy, with plenty of people arriving and leaving. I took in the view from the summit cairn, and then decided it’s time to go on. After Swirl How it got eerily devoid of people, and I strolled on my own onwards to the Grey Friar. A fine summit with views on Crinkle Crags, Bow Fell, Sca Fell and Scafell Pike I sat down for some water, figs and dates, trying to make out the path to the valley. 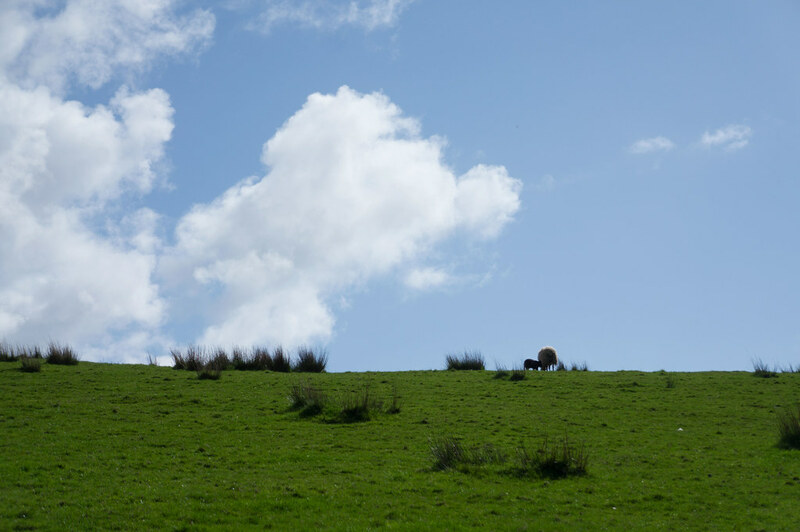 As I took off I followed a faint path, but soon I was walking on sheep trails down. I arrived in a muddy field amongst cows, between me and the street an insurmountable lake of wet cow dung. 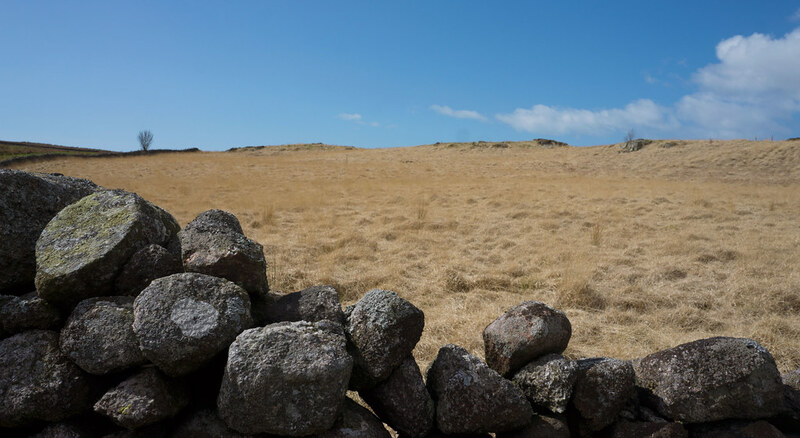 The cows looked on as I tried to avoid to step in their excrements, hoping from stone to a small green island of grass, but to no avail: As I reached the gate my shoes were covered in wet cow poop. At the road in Cockley Beck I sat down at the stream, tried to rinse and dry my socks, but the smell & colour of cow poop was intending to stay. Barefoot, eating nuts, I observed an old couple who happily arrived back at their car. After they packed up they came over to offer me a ride up the pass - they must have seen that I intended to go that way - but I kindly said “No, thank you” and explained that I’d mess up their car with my wet & dirty shoes. “That’s no problem” came the reply - an answer I least expected! I smiled and explained I prefer to walk, and thanked them again. After allowing my socks and shoes to dry a bit I slipped them back on and started the hike up Hardknott Pass road. Cars passing me smiled, and with some satisfaction I reached the top of the pass, from where I had a fine view on the Eskdale valley. I absolutely adore these views: Lush green fields speckled with white and black sheep, green forests, a blue river which meanders through the valley and lovely houses. 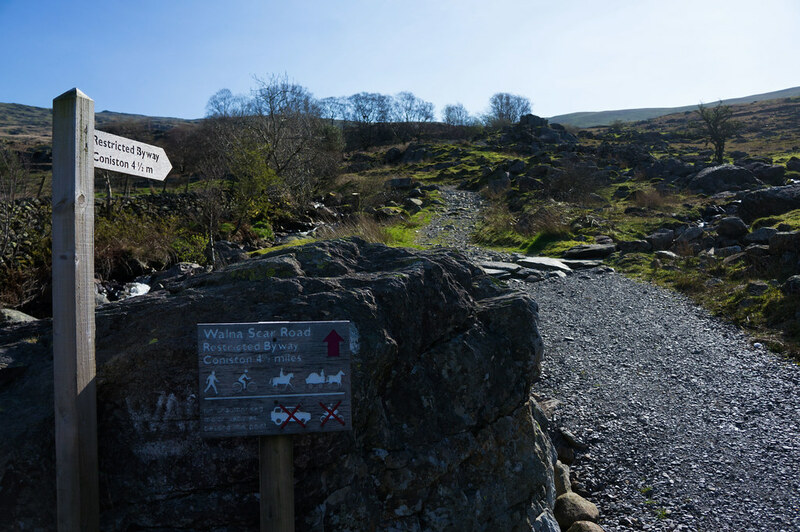 I passed by the Roman Fort and walked on the road till I saw the sign up to Sca Fell. 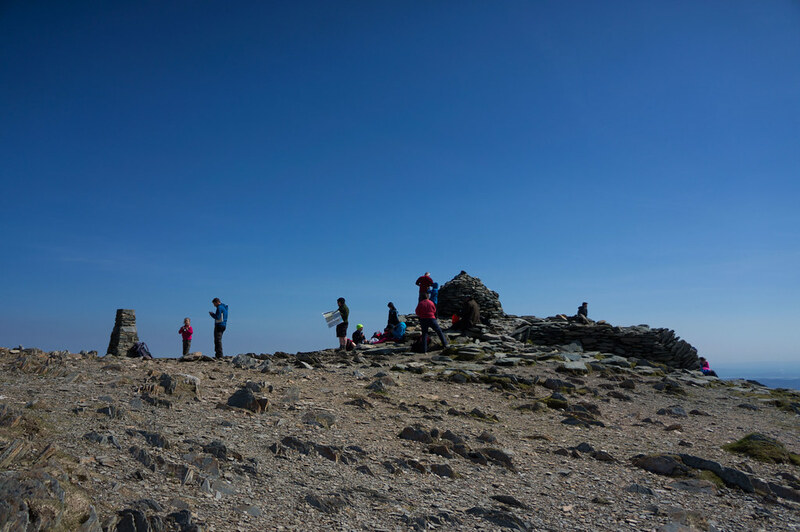 A family just arrived from the top, and with the clock being almost 17 they looked curiously as I hiked on. 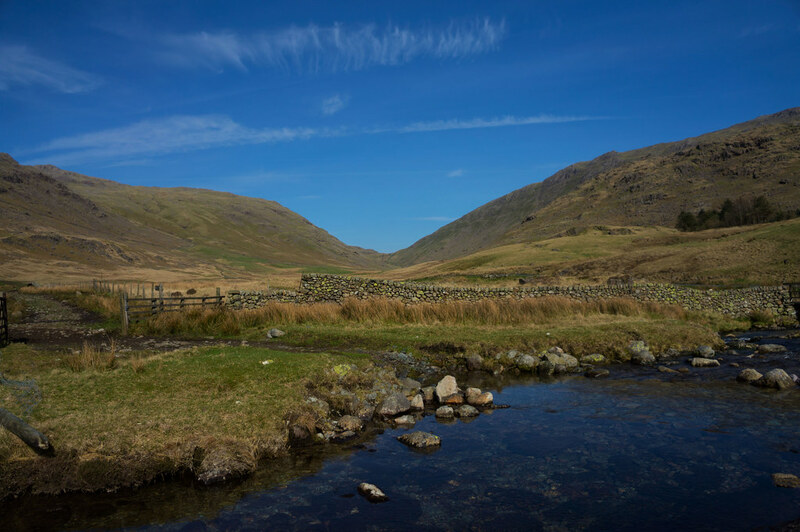 Now my plan was ambitious and I hoped to camp up on Sca Fell or at the Fox Tarn, though after almost 28 km hiked I decided to camp lower, in the vicinity of water, at a lovely camp spot. 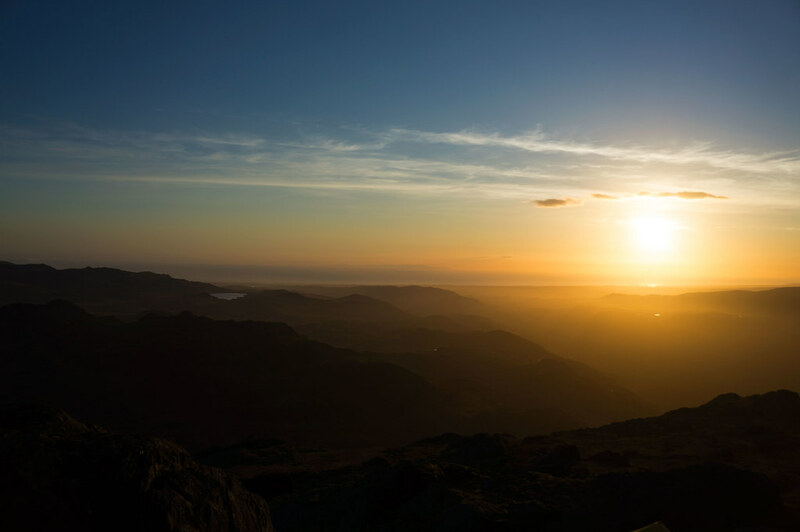 I pitched the TrailStar, boiled water for food, tea & dessert, and looked as a big, yellow moon was slowly rising at Hardknott Pass while the last cars of the day made their way up the street.